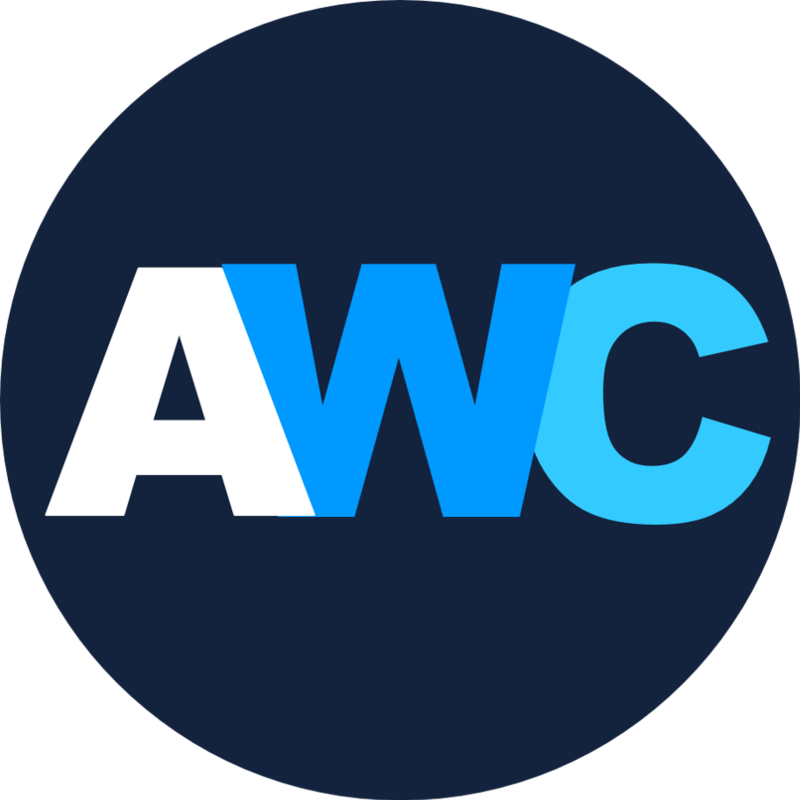 Check out our website and bookmark it for a one stop location for all AWC challenges! Once you've finished your challenge on hard mode you can start the challenge over for a 2 times complete. By doing so, you can earn the animated mastery badges to show off your dedication towards the genre. Your second entry has to be in a new post with new entries and it must contain a link to your original completed submission. Make sure to update your activity regularly as this is our only means of verifying a participant actually watched the anime they submitted for their challenge. When you have fulfilled all of the requirements for a challenge mode, please post a link to your submission in the Challenge Submissions forum post. We now have an AL AWC Recommendation bot - and it is enabled for this challenge! 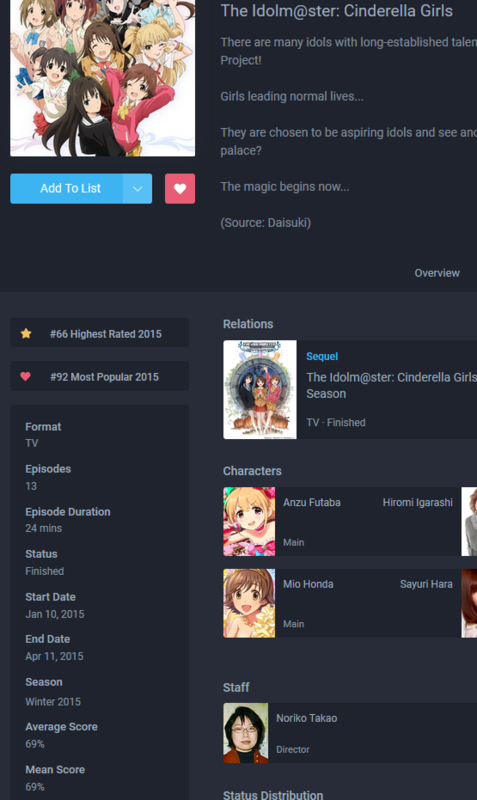 If an anime is missing a tag, please help make AniList better and add the tag. You can add additional tags by clicking the plus sign next to the tag list and filling out the form. Screenshots on how to do this are located in the helpful information section of the AWC FAQ. Information on where to find format and score is located in the helpful information section of the AWC FAQ. If the source listed is incorrect / missing make sure to submit a data change to help make AniList data more complete. Information on how to submit a data change and how where to find adaptations is located in the helpful information section of the AWC FAQ. Information on where to find aired year / season is located in the helpful information section of the AWC FAQ. Bonus requirements can be swapped for any four original challenge requirements. You cannot repeat requirements. 20. ✔️ Start: 23/08/17 Finish: 09/09/17 Watch a “Music” anime with 24 or more episodes K-On!! Music + School [Tag] OR School Club [Tag]: Gekijouban Hibike! Euphonium: Kitauji Koukou Suisougaku-bu e Youkoso, Tari Tari, Aikatsu! 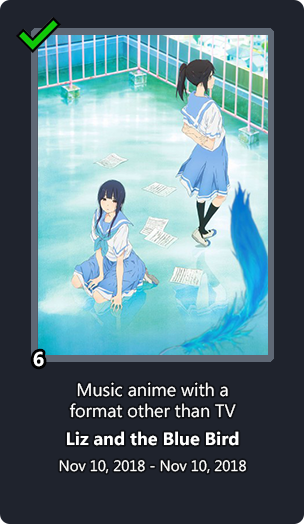 Music + Format IS NOT TV: Nodame Cantabile Special, Nodame Cantabile OVA, K-ON!! : Keikaku! Music 1st Letter A-L: Amazing Nuts!, Lemon Angel Project, Tenshi no 3P! Music + Main Character Plays Instrument [Experimental!! ]: Detroit Metal City, SoniAni: Super Sonico The Animation, Show By Rock!! Music + Primarily Female Cast OR Primarily Male Cast: The Idolm@ster Movie: Kagayaki no Mukougawa e!, AKB0048 First Stage, Aikatsu Stars! Music + Format IS NOT TV: K-ON! : Live House! 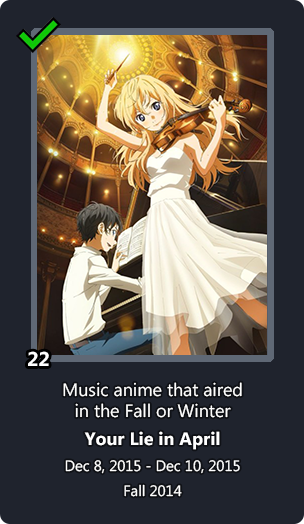 Music + Episode Count >= 24: K-On!! 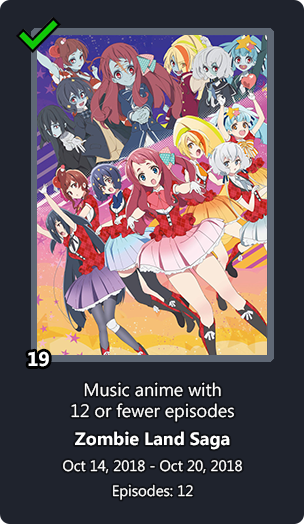 Music + Primarily Female Cast OR Primarily Male Cast: K-On! 4. [❌] Start: DD/MM/YY Finish: DD/MM/YY Watch a “Music” anime with the tags “Band” AND/OR “Musical” AND/OR “Dancing” Love Live! Sunshine!! 29. 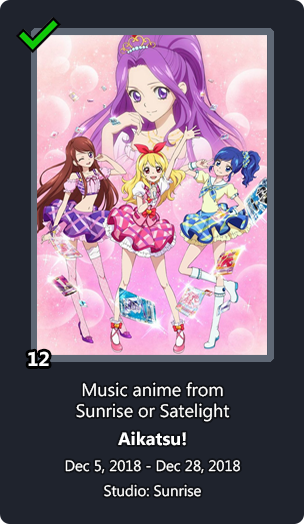 [❌] Start: DD/MM/YY Finish: DD/MM/YY Watch a “Music” anime from another participant’s challenge OR a "Music” anime recommended by a user on the AWC Discord Aikatsu! 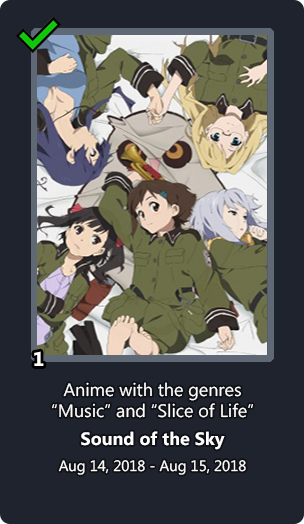 (6) [✅] Start: 24/01/19 Finish: 24/01/19 Watch a “Music” anime with the format other than “TV” K-ON! : Live House! Imported from MAL without dates. (25) [☑️] Start: 09/12/18 Finish: 10/12/18 Watch a “Music” anime with a main character that plays an instrument K-ON! Copy and paste the below text into the challenge forum post. Change only the text in red to add the information for your challenge. Music + Studio = Sunrise OR Satelight: Love Live! School idol project 2nd Season, Love Live! The School Idol Movie, Love Live! Sunshine!! Music + Season = Spring OR Summer: Nana, The Idol Master, Macross: Do You Remember Love? Music Relation = Sequel OR Prequel: Miss Monochrome - The Animation, Lovely Idol, Dream Festival! 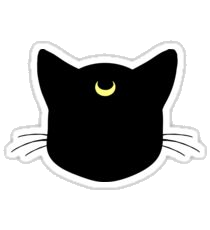 Music + Episodes Count <= 12: Genius Party, Shinkyoku Soukai Polyphonica, Amazing Nuts! 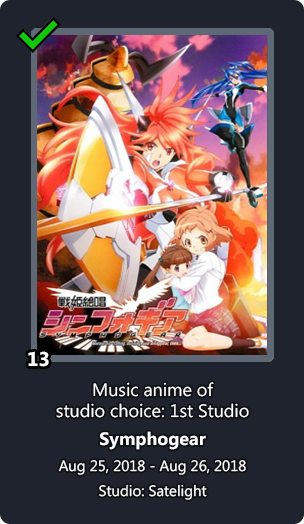 Music + Episode Count >= 24: La Corda D'Oro: Primo Passo, PriPara, Aikatsu Stars! Music + Main Character Plays Instrument [Experimental!! ]: SoniAni: Super Sonico The Animation, Show By Rock!! Music + Format IS NOT TV: K-ON!! : Keikaku! Music + Source IS NOT Manga: Koi-ken! : Watashitachi Anime ni Nacchatta! Music + School [Tag] OR School Club [Tag]: Gekijouban Hibike! Euphonium: Kitauji Koukou Suisougaku-bu e Youkoso, Love Live! The School Idol Movie, Aikatsu! 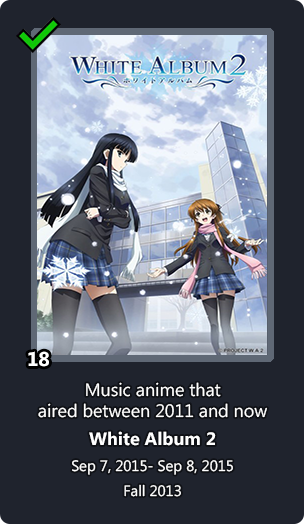 Music + Airing 2005 - 2010: K-On! 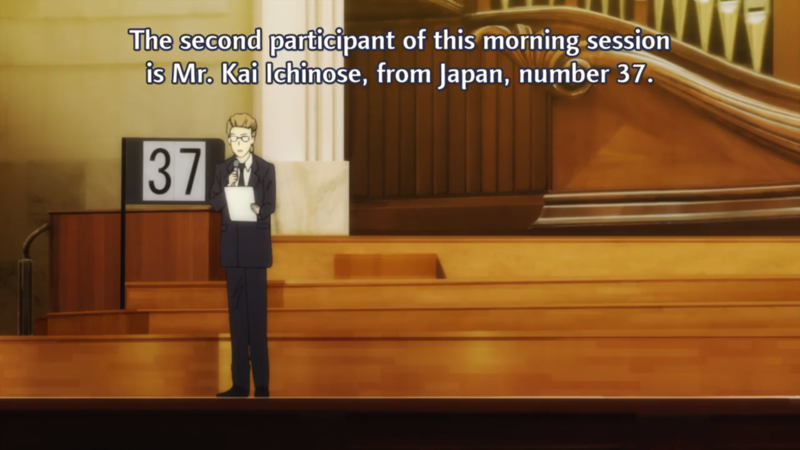 Music + Primarily Female Cast OR Primarily Male Cast: Wake Up, Girls! [X] Start: 09/07/18 Finish: 09/07/18 Watch a “Music” anime with the format other than “TV” K-ON!! : Keikaku! [O] Start: DD/MM/YY Finish: DD/MM/YY Watch a “Music” anime with the tags “School” AND/OR “School Club” K-On!! 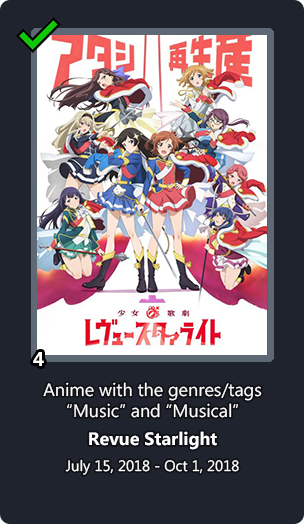 17.⭐ Start: DD/MM/YY Finish: DD/MM/YY Watch a "Music" anime that began airing between 2005 and 2010 K-On! 20.⭐ Start: DD/MM/YY Finish: DD/MM/YY Watch a "Music" anime with 24 or more episodes K-On!! Music + Mean Score <= 69%: Lemon Angel Project, Ongaku Shoujo (TV), Koi-ken! : Watashitachi Anime ni Nacchatta! 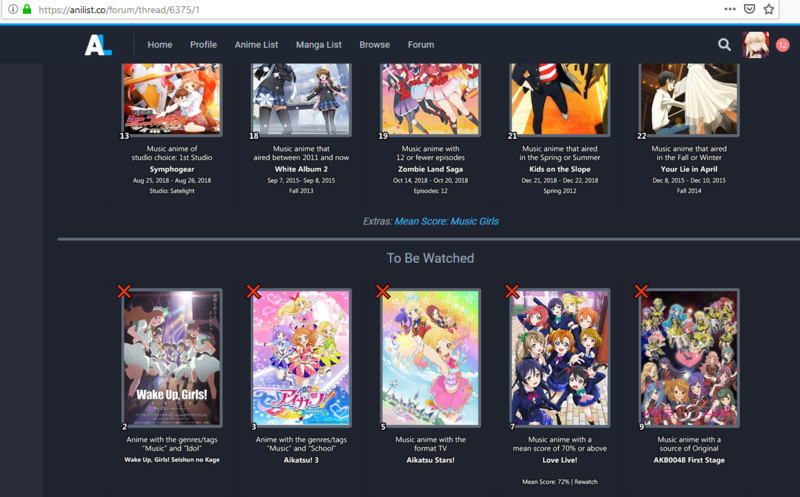 Music + Source IS NOT Manga: Bakumatsu Rock, Tribe Cool Crew, Show By Rock!! 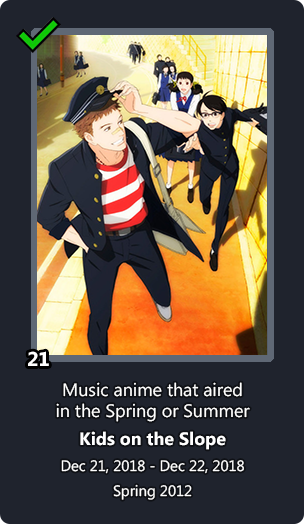 Music + Aired 2011 - Current Year: Miss Monochrome - The Animation, Shounen Hollywood: Holly Stage for 49, Tenshi no 3P! Music 1st Letter A-L: Aquarian Age: Sign for Evolution, Cello Hiki no Gauche, Amazing Nuts! 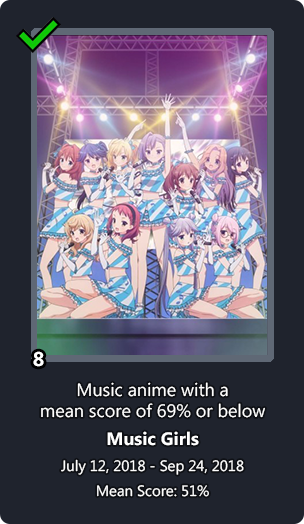 Music + Mean Score <= 69%: Forest of Piano, Fuuka, BanG Dream! Music + Studio = Sunrise OR Satelight: White Album 2, Love Live! School idol project, Love Live! Sunshine!! Music 1st Letter A-L: Aggretsuko, Love Live! School idol project, Love Live! Sunshine!! Music + School [Tag] OR School Club [Tag]: Tari Tari, Revue Starlight, Aikatsu! Music + Source = Original: I Want to Deliver Your Voice, STARMYU, Amazing Nuts! Music 1st Letter A-L: Lemon Angel Project, Angel's 3Piece!, Koi-ken! : Watashitachi Anime ni Nacchatta! Music 1st Letter M-Z: Samurai Jam-Bakumatsu Rock, Tribe Cool Crew, Show By Rock! !